An amazingly fun open world pirate adventure that would better served without the Assassin’s Creed franchise trappings. Assassin’s Creed is one of many major game franchises that I have never played, and never had much interest in (see also Metal Gear Solid, and any horror franchise). I didn’t have anything particularly against it (other than Ubisoft’s terrible treatment of the PC) but the historical settings didn’t really excite me, and the themes seemed a bit dour and serious for my taste. 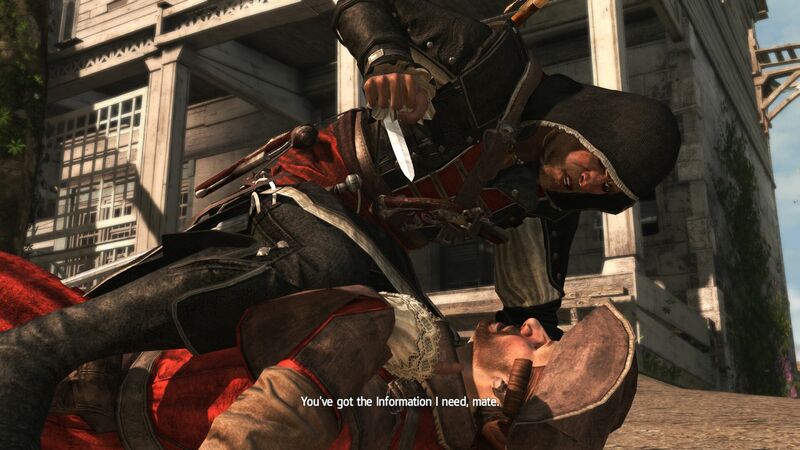 Enter Assassin’s Creed IV Black Flag, my first Assassin’s Creed game. Black Flag takes place in the early 18th century, during the height of merchant trade, colonization, and pirates along the new world and the Caribbean. I adore the pirate theme – the ships that act as your mobile command center, the unique combination of swords and pistols, the dichotomy of lawlessness and imperialism. It translates so well to gaming it’s a shame we haven’t seen more pirate games. I still count Sid Meier’s Pirates! as one of the best, and the remake is over 10 years old. Thus I finally decided to give an Assassin’s Creed game a chance, after a hefty Steam sale of course. Black Flag immediately immersed me into its fun world of pirate assassins, naval combat, and the open world of the Caribbean sea. In many ways it embodies the modern AAA video game – dumb story, cliché characters, incredible production values and tons of collectibles and modern gaming conveniences. At times it’s directly at odds with itself, serving up gorgeous environments and embracing its pirate themes while annoyingly shoving very video game-y elements in your face like a steady stream of collectibles, icons, and button prompts. 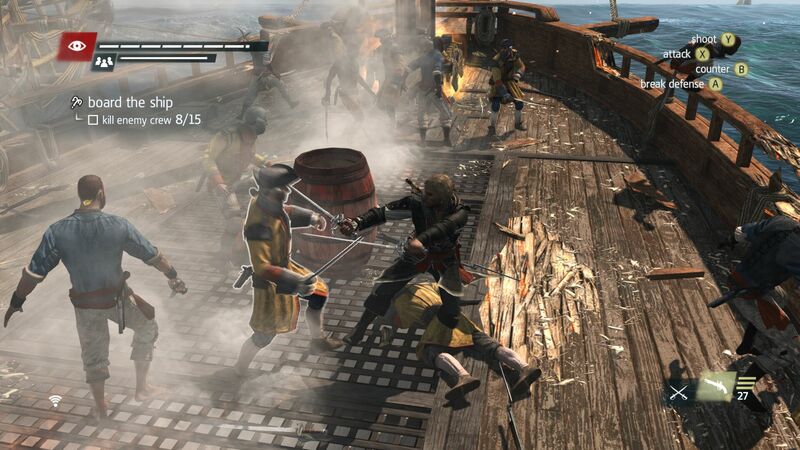 As my first AC game, Black Flag kept me enthralled with its simple but effective stealth and combat mechanics, and the world was fun to enjoy, for a time. After the initial shine wears off, however, the story failed to keep me involved or interested, very few of the characters were interesting or likable, and you stop learning new abilities and tactics. Even when mostly focusing on just the main story missions Black Flag is a bit too long for its own good. But it’s also the closest I’ve ever come to living out my pirate fantasies. You play as Edward Kenway, a selfish jerk who leaves his wife behind in England to go play pirate for a few years and earn some money. During the fantastic opening sequence (which is nicely playable) you’re attacked by an assassin and shipwrecked on an island. The tutorial does a lovely job teaching you the impressive way in which Kenway can traverse the world. Parkour techniques are all the rage in gaming now, and Kenway can climb houses to run along rooftops, hang off ledges, and crouch on posts. He’s not exactly a superhero and lacks the fun tools of Batman or Rico (from Just Cause) but the movement remains pretty fun throughout. When it works. Often I’d run way too far, miss or ledge, or bump into an enemy on accident, ruining my well-planned jump or stealthy maneuver. The controls are finicky, though they worked more often than not. Kenway kills and assumes the identity of the assassin, which translates nicely to another tutorial as he learns the tools of the trade. As a veteran of the Batman Arkham games I was familiar with the assassination techniques that are used here, though the limited tools keeps them fairly basic. I found myself mostly using the air assassinations, and it’s not until very late in the game that you get access to a rope hook that lets you get creative. The town of Havana acts as your initial urban setting. Locating and climbing to the top of viewpoints opens up a good chunk of the map, revealing the dozens of collectibles in an area as well as providing a fast travel location. Collectibles range from treasure chests to sea chanties to treasure maps and floating fragments. It can be overwhelming for completionists but they’re all entirely optional. Chests are the most useful as money can be used to purchase better swords and pistols, upgrade your ship’s various weapons and hull, and upgrade your own little pirate town once you get it. The RPG elements are extremely light, and I feel like it really could’ve used at least a skill tree to help give a sense of progression to Kenway’s abilities. Less than halfway through the game I’d already purchased the best equipment, while the ship takes a bit more work requiring resources you have to capture from enemy ships. You get your own ship pretty early on, and it’s absolutely fantastic. The controls work surprisingly well, with varying speeds and a generous camera. I loved that different kinds of mounted weapons automatically switched depending on the view I was looking through. For example, a side view launches your regular round shot cannons, while a chase view can fire chain shots, and a mortar through your telescope. 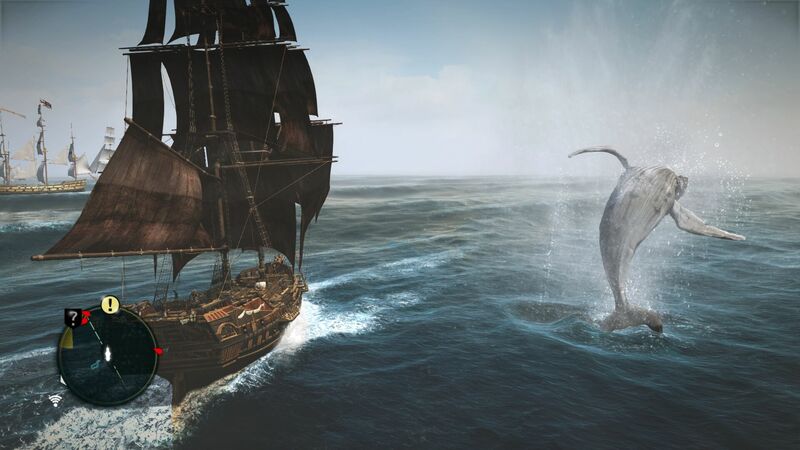 Any other ship can be attacked in the world, and even moreso than the various towns and areas filled with people did the oceans really come alive with ships moving around and firing on each other. The freedom to take enemy ships is a fun ongoing adventure. Weakening them gives you the option to board, switching back to Kenway as you vault to the enemy ship with your crew and fight an always exciting and chaotic battle to retrieve their goods. Attacking naval forts results in a similar ship-then-land combat sequence, and the fort reveals a large chunk of the map as well as providing its own side quests and amenities. In addition to various location-based actives like deep-sea diving and infiltrating guarded warehouses, structured side missions also dotted the world. They mostly come in two flavors – assassin contracts and templar missions. Assassin contracts are little one-off missions that task you with taking out a nearby guarded NPC, while templar missions involved a small series of quest as part of a mini-story. Neither were particularly note-worthy but the sheer wealth of content is absolutely staggering. Even when the initial disappointment of discovering that most land masses were unexplorable, there’s still a ton of game to be had. By focusing on specific towns, forts, and a few jungle areas Ubisoft could craft each one as a unique and fun location worth exploring. Throughout the adventure the game world pulls back out of the pirate setting and into a near future real world. 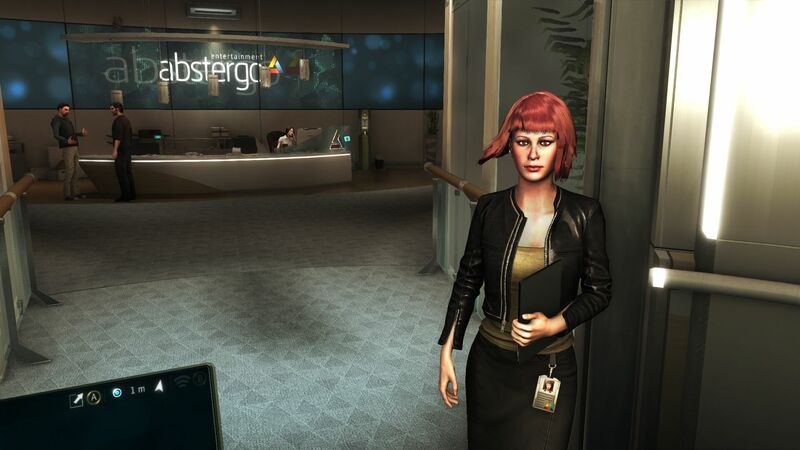 The perspective shifts to first-person as you play an employee of Abstergo, a company that tasks you with ‘playing’ the pirate world to create a VR-style adventure game. It’s incredibly weird and bizarre for someone that’s never played an Assassin’s Creed game before, and I found each of these interludes incredibly distracting and silly, full of dumb little minigames and weird exposition. Maybe it works better for AC fans but I’d have been much happier if the pirate world had never been treated like a simulation. The main story does an adequate job shepherding you around to various locations around the Caribbean, from the large town of Kingston to the jungles that the assassins call home. Kenway falls in with a bunch of stereotypical pirate figures, most of whom end up dying dramatically, or betraying Kenway before later dying dramatically by his hand. The town of Nassau acts as your initial hub but when it’s lost you end up building your own at a new site. The game flirts with some odd and ill-placed Tomb Raider-y elements like ancient temples and supernatural events that I was not overly fond of, but thankfully doesn’t really detract from the main pirate and assassin stuff until the end. The story is at its best when it’s dealing with pirates and the trouble that follows them. The fact that they’re essentially criminal-mercenaries could provide a wealth of wonderful storylines, but the game refuses to ever delve too deep. I felt constantly hamstrung by the ongoing narrative involving the assassins as freedom fighters and the templars on a quest to become the illuminati. It doesn’t mesh very well with the much more enjoyable pirate action. 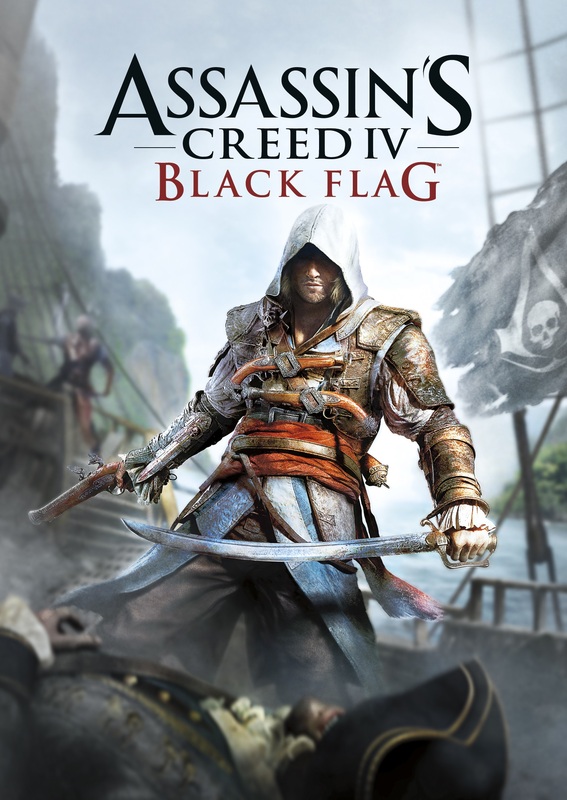 I was constantly wishing that Black Flag was not an Assassin’s Creed game at all, and thus wouldn’t be hampered by the overly serious assassin’s plight or the cartoon villainy of the power-hungry templars. Sailing the open waters, getting betrayed by fellow pirates, exploring new islands and underwater caverns, boarding enemy ships – Black Flag has a constant stream of pure pirate fun to dish out over dozens of hours. I can’t say it made me a fan of the Assassin’s Creed series but I was still blow away by the amount of content and attention to detail and world-building. Given another amazingly fun setting I could definitely see myself playing more games in the series. 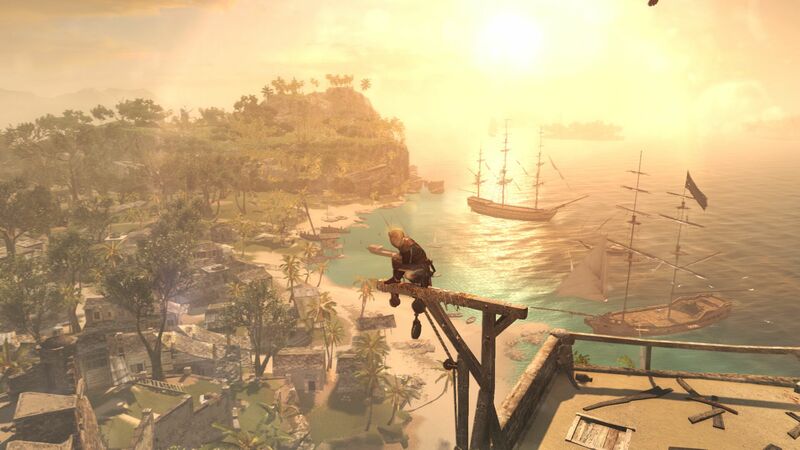 More than that I would love more open world pirate games that utilize the brilliant mechanics and gameplay that make Black Flag so much fun. Final Say: An amazingly fun open world pirate adventure that would better served without the Assassin’s Creed franchise trappings.